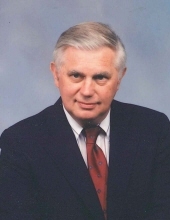 Clifford Dean Rolan, 83, formerly of Lubbock, Texas, passed away on March 28, 2019 in New Braunfels, Texas. He was born on February 9, 1936 in Ladonia, Texas to Edgar and Opal Rolan. He is survived by his wife of almost 61 years, Louise Karen Rolan; one son, Terry Rolan and wife Teresa Tice of Columbia, Missouri; one daughter, Lynda Rolan and husband Wesley Mings of Canyon Lake, Texas; four grandchildren, Jason Rolan of Vientienne, Laos, Sarah Benn and husband Jayson of Akron, Ohio, Bethany Rolan of Houston, and Sofia Mings of Canyon Lake; and one great-grandchild, Suzi. He is also survived by two brothers, Don Rolan and Joel Rolan; and one sister, Venita Rolan. Clifford retired after 50 years of serving as Branch Manager for Orkin Exterminating Co. in San Angelo, Amarillo and Lubbock. A memorial service will be held at 3:00 p.m. Friday, April 5, 2019 at the Lux Funeral Home Chapel in New Braunfels, Texas. In lieu of flowers, memorial donations may be made in Clifford’s name to Hope Hospice, 611 N. Walnut, New Braunfels, TX 78130, or Building Fund, First Baptist Church New Braunfels, 733 Cross St., New Braunfels, TX 78130. To leave a message for the family, please visit www.luxfhcares.com and select obituaries. To send flowers or a remembrance gift to the family of Clifford Dean Rolan, please visit our Tribute Store. "Email Address" would like to share the life celebration of Clifford Dean Rolan. Click on the "link" to go to share a favorite memory or leave a condolence message for the family.